Regionalne Orly Eksportu (Regional Eagles of Export) is a series of events organised in Poland. The program is being authorised by the Ministry of Foreign Affairs and the Ministry of Development. The purpose of the program is to support Polish exporters with their international expansion. 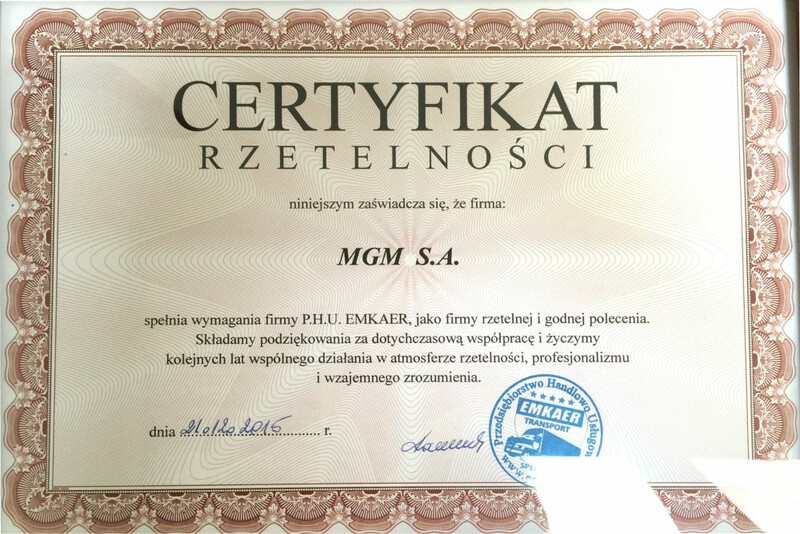 In the contest, MGM S.A. received an award in the category of ‘Mazovian Voivodeship Eagles of Export’. The “Golden Payer 2015” program helps in finding reliable and trustworthy business partners among companies across many industries. More information about “Golden Payer” program is available on the website of the financial and insurance group Euler Hermes. Certificate of Credibility for MGM S.A.
International Information Agency Creditreform examined the creditworthiness of our company. 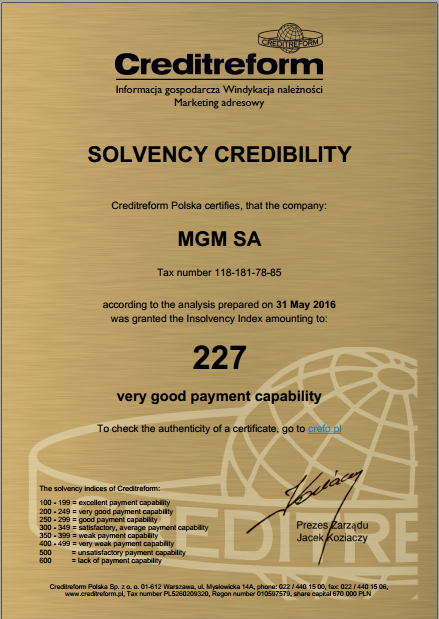 The creditworthiness index (Creditreform rating) for the MGM S.A. was 227 points which correspond to very good capacity for the timely payment of obligations and the company was awarded with the prestigious Certificate of Credibility. 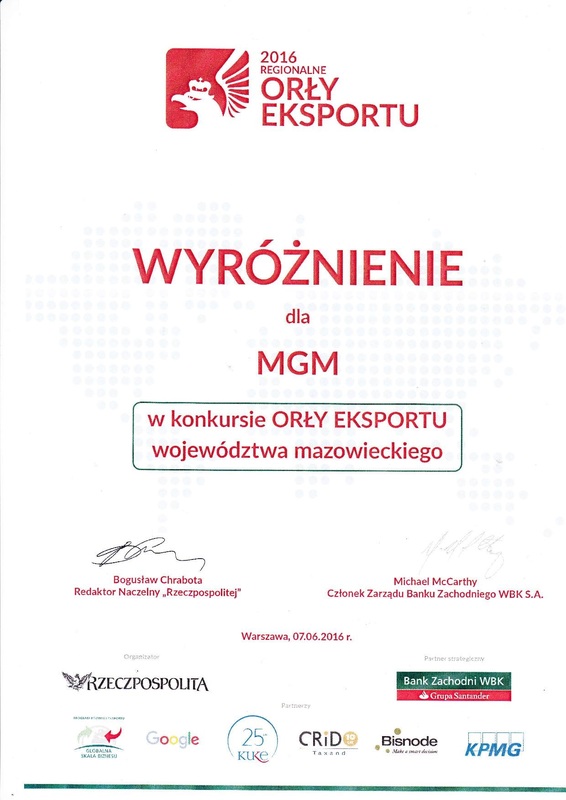 In the ranking ("Lista 2000") of Polish newspaper (Rzeczpospolita) year 2015, the MGM company had received 713 place in the category of Polish companies and 150 in the category of exporters. 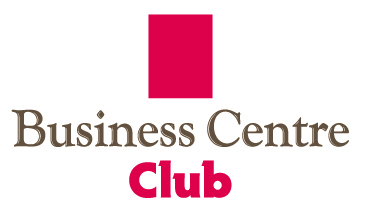 The MGM becomes member of the Business Centre Club - a prestigious businessman club and the biggest organization of individual employers. The company becomes one of its 2500 members (persons and companies) who represent around 250 cities in Poland and are organized in 24 regional BCC Chapters around the country. MGM was invited to join Business Centre Club as a reliable and trustworthy company which follows the rules of trading ethics and accepts the principles of the code of honor of the BCC Members. The MGM advances in the prestigious "Forbes Diamonds" ranking. 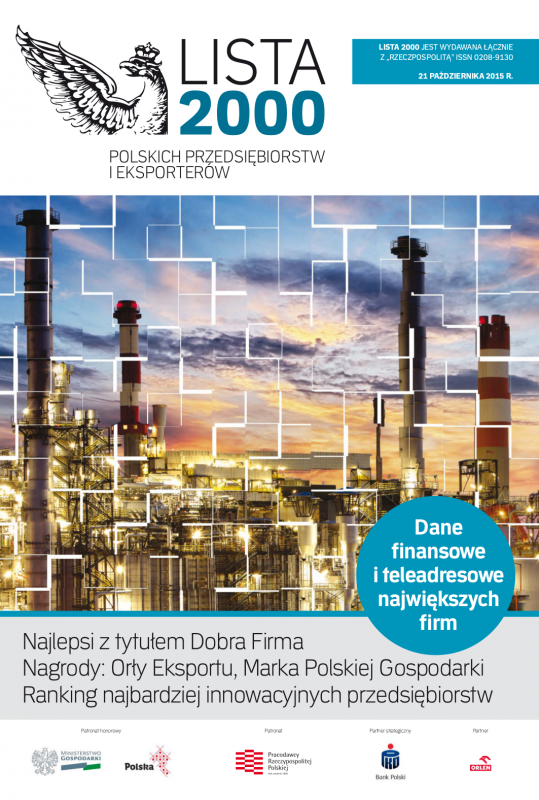 As a result of the dynamical growth of our company we placed on the 11th position in the country’s ranking of the companies with the turnover in the range of 50 to 250 million PLN. In the same category we reached the 5th position in the Mazovieckie Region. 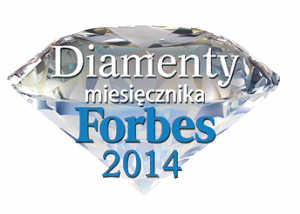 The Forbes magazine awards the „Forbes Diamonds” to the best enterprises in the region and country. 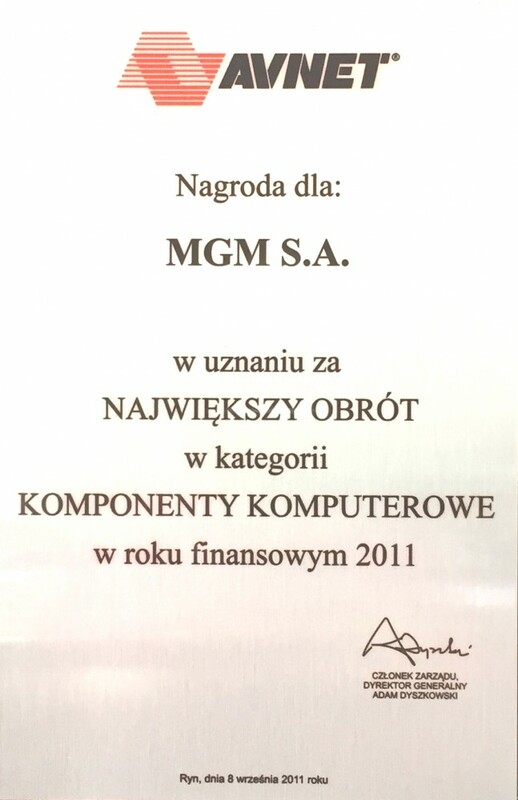 The MGM company received an award for the best export in category of computer components, acknowledged by Avnet. MGM is awarded the title of the „Business Gazelle” for the 3rd time in the ranking of the most dynamically growing small and medium size companies organised by the magazine “Puls Biznesu”. In the 15th edition of the ranking, like in previous years, the entrepreneurs had to achieve high development results such as stable growth and increasing profits from sales. HGST awards MGM S.A. as "Business Partner"
MGM is distinguished by the Forbes magazine. In the contest which selects the most prosperous companies in the country and region MGM joins the ranks of champions and is awarded the title of "Forbes Diamonds". In the category of the companies with the turnover in the range of 50 to 250 million PLN MGM S.A. reaches the 17th position in the national ranking and high 5th position in the regional ranking of Mazovieckie. For the stable growth and the continuous improvement of financial results MGM is awarded the title of the "Business Gazelle" for the 2nd time. This distinction is awarded in the 12th edition of the ranking organised by “Puls Biznesu” for the most dynamically growing small and average companies in the country. MGM is distinguished by the Western Digital with the title „Platinium Partner Select WD”. 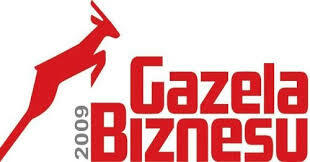 In the 10th edition of the „Business Gazelles” , MGM joined the group of the most dynamically growing small and medium size companies and is awarded the title of “Business Gazelle”. The awarded companies had to comply with high requirements related to stable growth and excellent financial results. AMD awards MGM with the title of “Platinum Channel Provider”. An award for the biggest rotation in category of computer components.